Clean Well Water Report: How Can I Remove Odor from my Well Water Without Using Chemicals? How Can I Remove Odor from my Well Water Without Using Chemicals? Like reading your blog, learned a few things, thanks! Our problem is we have iron, and a low level but very obnoxious odor. We have a water softener, but I think it can’t keep up with the iron, and it doesn’t help with the odor at all. I sent in my test results to you, what do you recommend for our somewhat stinky well water? Aeration? Thanks for reading the blog and sending in your water test results. Upon review of this I’d recommend a Pro-Ox Air Charger with a Spindown Filter. 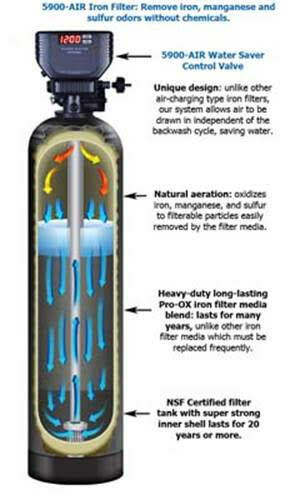 The Iron Filter uses air injection directly in the filter to oxidize the contaminants out, and then passes the water through a mixed bed of filtration media specifically designed to remove iron, manganese and odor from water. This is an automatic backwashing system that rinses out the media about once per week in order to keep the media clean as well as maintain a head of air for the oxidation purposes. This filter also doesn’t need to do a full backwash every night like every other air charger filter does. Instead to replenish the Air Pocket this unique valve skips over the backwash right to the suction section and then back to service once completed. The media inside the filter, Pro-OX has a much higher surface area, and is much more porous, and also lasts much longer (usually between 10 - 12 years) than other iron filter media such as greensand. These filters are fully automatic and use the reliable 5900e control valve for dependable filtration with minimal maintenance requirements along with being quite user friendly in operation. 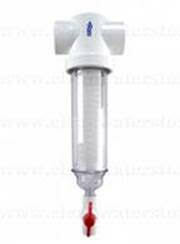 An optional post Cartridge filter will polish the water and be able to monitor the systems overall performance. This can of course be implemented later if you prefer. The Spindown filter would be installed upstream of the Iron filter so as to protect against sand/sediment from entering the control valve and causing unwanted problems. You can also use this to shock the filter/house with Chlorine or Peroxide from time to time as will help eliminate any iron bacteria in the pipes and iron filter. This uses a mesh screen thus no filter cartridges that need constant servicing. Simply flush the valve for 10 – 20 seconds as needed and done. The following will show images, a brief description of each, system cost, warranty specifics, along with product links for more information. As you have purchased a test kit with us I’ll also extend a $25.00 discount toward the system purchase. 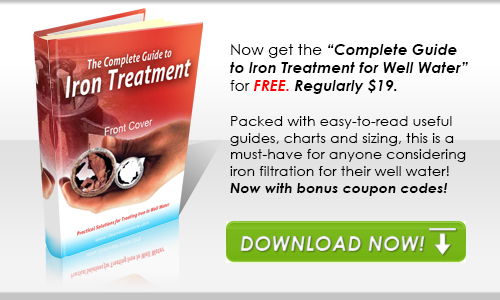 No potassium permanganate, or chemicals required, although unlike other iron filters. This system also works with chlorinated water, but is not required. Dimensions: 9" diameter x 55" height with the valve attached. 1” connectors, media, valve, and bypass is included. All installation and start-up guides will be sent directly to you and we are available for tech-support as well should you have questions during installation or down the line. Excellent warranty: 10 years on the media tank; 7 years on the control valve. Thanks again for contacting us to treat your water, I look forward to hearing from you.